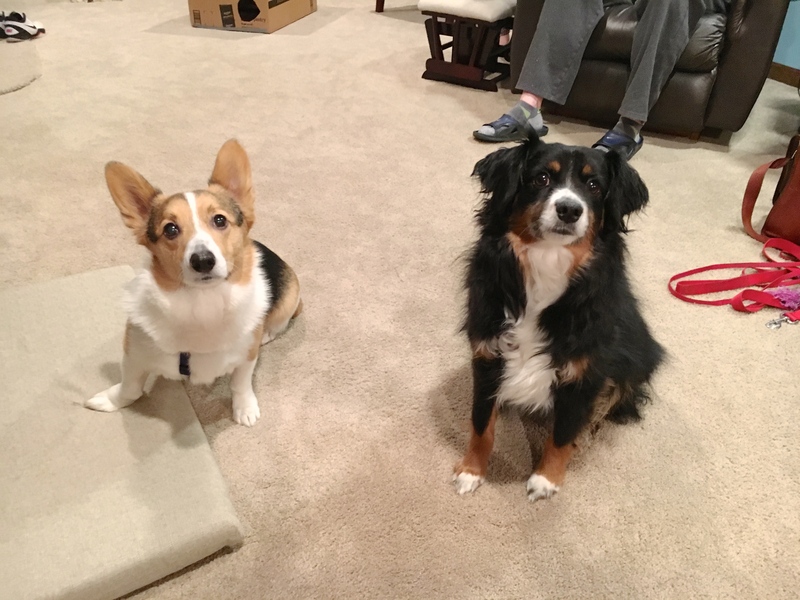 For this special, hearing impaired dog behavior session I worked with Beast, a four-year-old Corgi who lives in Omaha with Crash, a three-and-a-half-year-old Australian Shepherd. Their guardians set up a dog behavior training session with me to stop dog barking, over excitement and leash pulling. As their guardians have hearing issues, we were joined by a very nice sign language interpreter named Julie. Crash the more animated dog once I stepped inside the house, but both herding dogs were clearly excited to meet me. After observing the dogs and getting more information from their guardians, it became clear that the reason the dogs weren’t behaving how their guardians wanted was the humans didn’t teach them how they wanted them to act in various situations. If it were our clild and a teacher who didn’t teach them the subject matter, we would be very upset with the instructor for not preparing our children to succeed. But when it comes to dogs, I see this problem all the time as a dog behaviorist. I shared a number of dog training tips and dog behavior secrets with the dog’s guardians as well as new ways to communicate to them and add structure so they see and identify the humans as authority figures. It was clear that before the session, the dog’s considered themselves to be peers or superior (and responsible for) the humans. This resulted in the dog’s feeling a false sense of responsibility for the dogs which can add stress and the accompanying stress hormones can have a cumulative effect. One activity the dogs got over excited for was getting ready for a walk. I spent about ten minutes showing them how they can stop or pause during the leashing process to communicate to the dogs that they would only continue if the dogs were calm and balanced. It really didn’t take long to get the dogs to stay behind the human and stay calm when they leashes were picked up. But by spending the time and stopping with precise timing (when the dogs move in front or dog gets excited), the human was able to get the message across. Teaching a dog to behave how you want is pretty easy once you break it into small manageable steps; be it leash training, door behavior or during meal time. Once we wrapped up how to keep the dogs calm during the leashing process, the next step was to head out for an actual walk. I showed the guardians how to add the special twist of the leash to a Martingale collar to stop leash pulling, then went over my rules for a structured walk. I wish I had filmed the walk because the dogs and their humans all did amazing. Seeing the dog walk next to the handler with a loose leash and minimal corrections brought a smile to all the human’s faces. When we returned to the house, Julie the interpreter was kind enough to sit down and translate as I went over the dog’s roadmap to success which you can watch in the video below.